Chicago Getting Ready To Rewind? 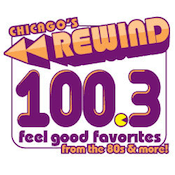 Update 6/7: As we first reported on May 23, WILV has rebranded as “Rewind 100.3“. The format stays the same as 80s based Classic Hits with a sprinkling of 70’s and 90’s. Original Report 5/23: Bonneville appears poised to bring the “Rewind” moniker it birthed in Cincinnati to its unnamed sister in Chicago. Like its sibling in Cincinnati”Chicago’s 100.3” WILV features a Gold Based AC format billed as “Feel Good Favorites”. The past two weekends have featured “Rewind Weekends” featuring mainly 70s and 80s hits. Suspiciously, Rewind1003.com and ChicagosRewind1003.com were registered earlier this month. The Rewind branding has taken off this month as Clear Channel relaunched its Classic Hits stations in St. Louis and Lexington, KY under the moniker, while a Newcap brought the moniker to Sudbury, ON.